Lifestyle TV Channel / NDTV Good Times is the flagship channel of NDTV Lifestyle Limited which is owned by New Delhi Television Limited. It was launched in September 2007. 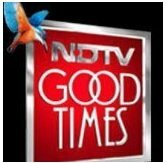 NDTV Good Times underwent a makeover in November 2013 to redefine the lifestyle entertainment category codes once again. From being India's oldest lifestyle channel, it became its youngest with programming that is impulsive, interactive and with an attitude that resonates with the youth. The new logo, icons, indents and a vibrant and dynamic colour palette are a testament to the channel's continuing evolution as India’s premier lifestyle entertainment destination.